I wanted to chime in after taking my "new" 9VR out in the cold tonight. 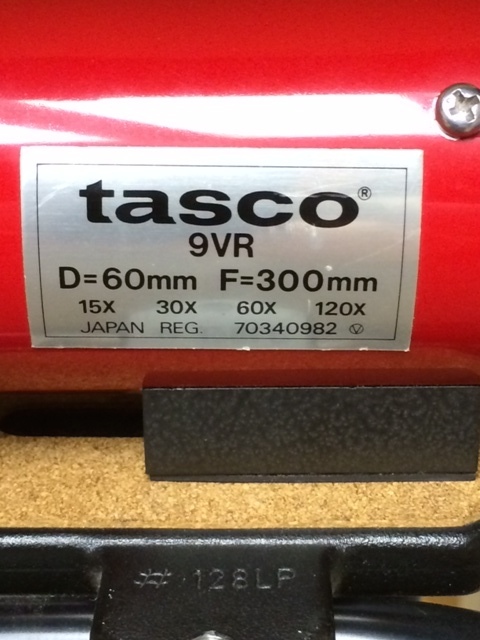 I've posted here for a while about the Tasco 99VR that I got a couple of months ago. I was impressed with the view, focuser and convenience. It's got Diamond Z markings on it, and I noticed that the objective is stopped down at the front of the tube to be about 30 mm or so. So I got a 9VR from CN Classifieds earlier this month, and I finally got some time outside with it tonight. This is a Vixen scope, and it doesn't have the baffle/stop right behind the objective. 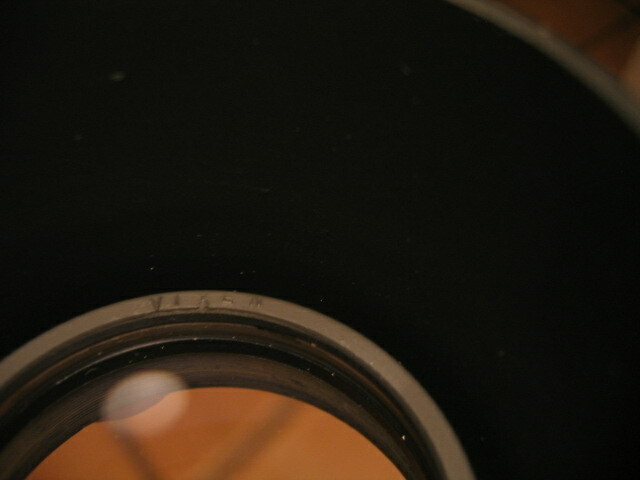 Also, the focuser is much smoother. 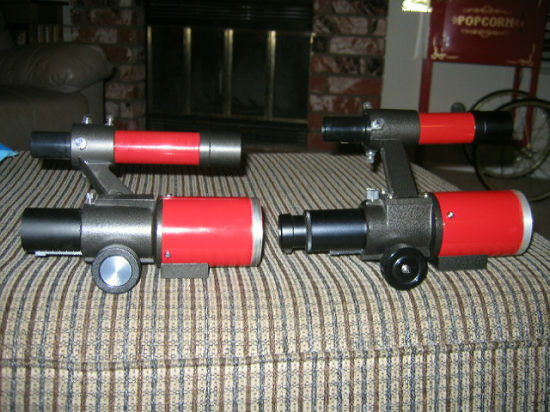 It's almost like Diamond Z made a scope that would look exactly like the Vixen. Without the baffle it is much brighter than the 99VR. The total field for the two scopes is close to the same size at 10x, and the center of the field of the Vixen is much sharper than the edge. I plan to swap the objectives at some point to see if the edge of field for the 99VR is as good, and if so I'll pull the baffle out. Performance: The Vixen with my 6 mm Meade ortho separated all of the parts of the Trapezium, and found plenty of fuzz. I was really impressed with the view this thing can put out. Even the finder scope put out a decent view of the area at 6x. I'm just amazed. I added a C90 kit with 18mm, 30mm and diagonal, and it's awesome to use. Edited by DocFinance, 26 December 2014 - 12:10 AM. Thanks for the review. I too have this model and like you was surprised at what it can do. I was so impressed I got one for my son as well who will be shipping out to Japan soon and can't take much gear with him. The little table top tripods are excellent as well, very heavy duty, and I recommend trying to track down a slo motion control if you can. If you can't find the original Vixen unit, Orion sells one for about 40 dollars on Amazon which is quite nice as well. 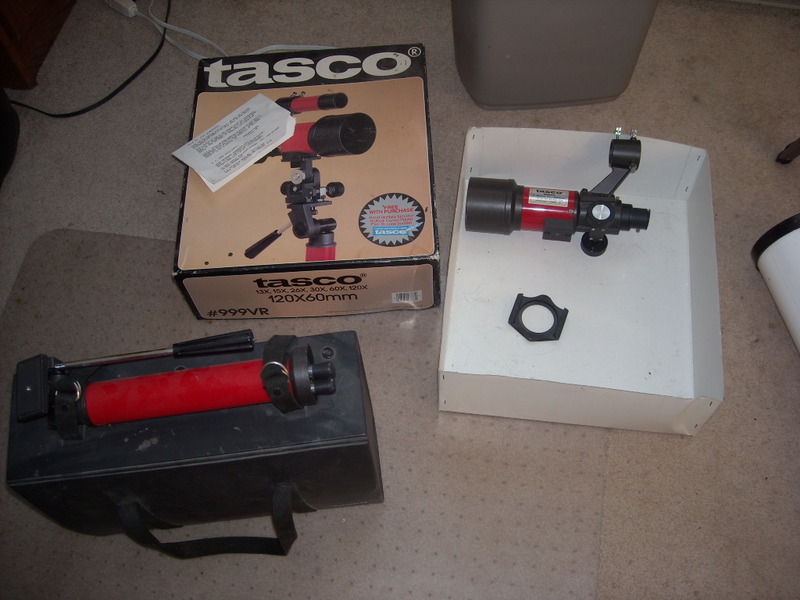 I've viewed through the Tasco and the Celestron version, and both are identical. Meade also made one but it is baffled very close to the objective, but in other respects is almost identical. The weak spot on all of these scopes seems to be the focuser knobs, which will crack if screwed down too hard to the shaft. All in all, wonderful little scopes, and they weigh almost nothing. Remarkable quality. I'm still experimenting for my favorite eyepieces to use. So far I have been using a 25 Kellner, 12 and 6 ortho and it every nice. Nice thing is they all take the Vixen 1.25" visual back, so if you happen to have one that is set up for .965, a change to 1.25 is simple as pie. 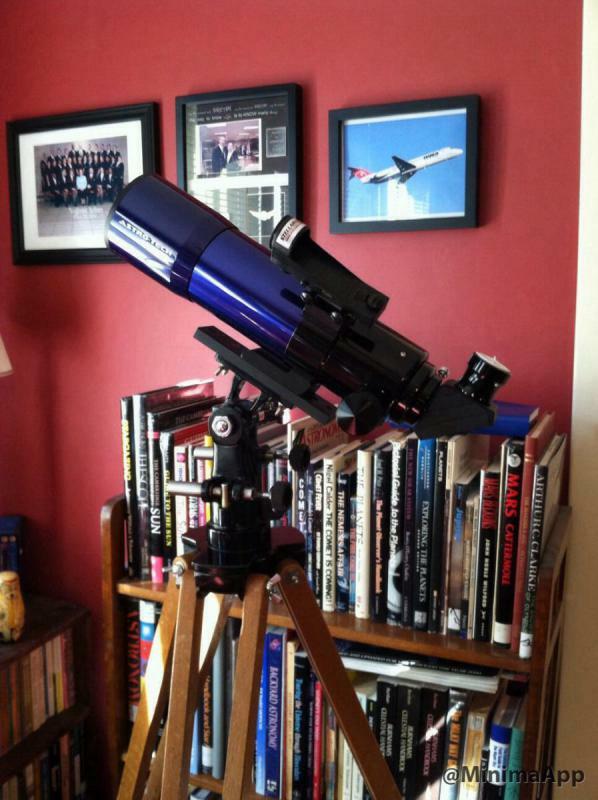 Correction: I just looked at the Meade version of this scope, and it does not in fact have a stopped down objective. 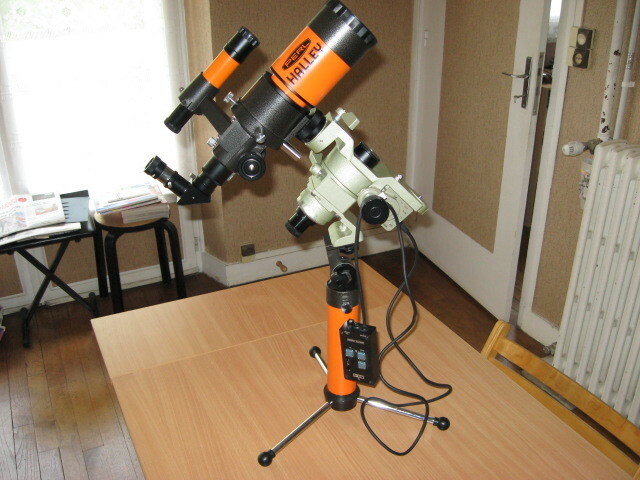 It does have a slightly smaller objective, I believe, than the Tasco and Celestron versions by Vixen. The Meade is not made by Vixen, as far as I can tell. The other two bear the Vixen markings, the Meade does not. That said, the Meade also presents a pleasant view. Edited by choran, 25 December 2014 - 02:43 PM. Edited by Steve_M_M, 25 December 2014 - 10:36 AM. Edited by Steve_M_M, 25 December 2014 - 10:38 AM. These scopes ARE surprising ;certainly a better view than I expected from a small spotter-style scope. 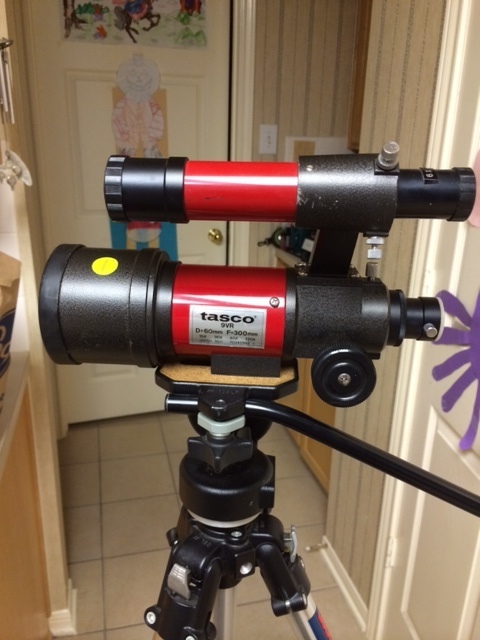 I have the :Celestron CO-62,Meade 277, and Tasco 9 and 999VR variants;the CO-62 is my favorite.Had a quite enjoyable session this past summer playing with the C0-62 on a couple good nights .Super nature scope ,too. There is no doubt that you will enjoy your Tasco 9VR. I have her bigger sister: Vixen Halley 70/400. These scopes are just awsome. There is usually a substantial difference in the 9VR, 99VR, and the 999VR. The optics of the Vixen 9VR are much better than either of the other two. This is why the 99 and 999 version have that substantial aperture stop. I've removed the stop on a 999VR and the edge correction and chromatic aberration was such that I put it back. Performance with the stop in place is....OK. The Vixen 9VR performs well with the full open aperture, is a pleasure to use, and deserves the following it has. 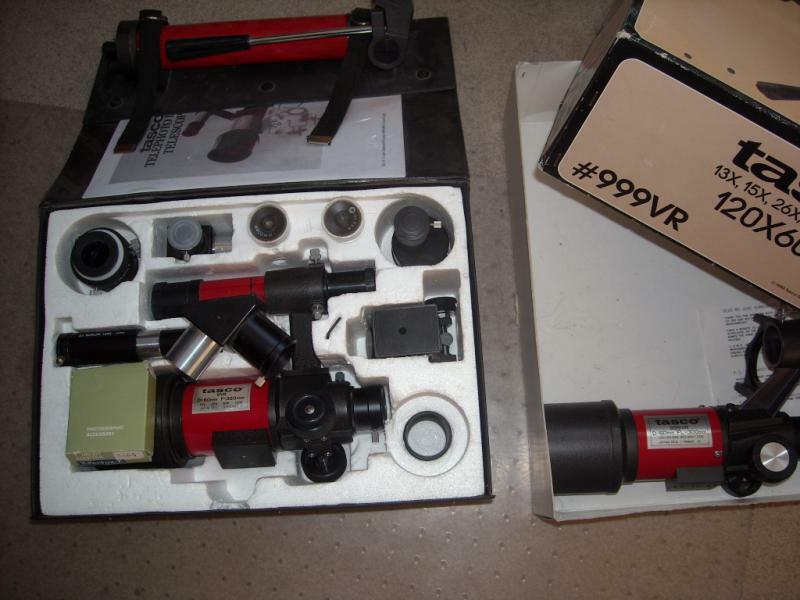 I keep the complete kit in the box but have added the Vixen 1.25" adapter and a .965" collar to use the original eyepieces in the box if desired. 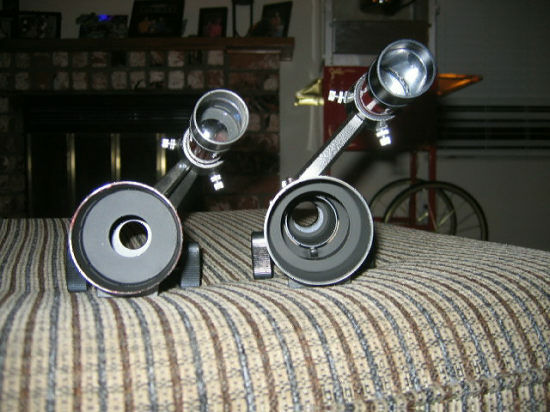 The eyepieces are decent as well. There is a substantial difference in the Vixen 9 eyepieces and the Diamond Z eyepieces that mine came with. The collapsing tripod did not come with the Vixen 9VR as far as I know. However, the carry case does have mysterious straps on the top that are perfect for attaching the table tripod as shown in the photo. That tripod is a nifty sweeeeeet little item. It's cool. The 99 is certainly worth what I paid for it (like $60 with everything, a tabletop tripod and three quality EP outside of the stock ones), but the Vixen just gives a much better image. I'll try to test with the baffle-free tube tonight, but I'm also planning to take out a Jason/Empire 50mm on an EQ1 that I put together today. I discovered that this Jason fits on the EQ1 without rings or any modification. Edited by DocFinance, 25 December 2014 - 08:31 PM. Now *that* is a cool little setup. I've never seen the 70mm version of the Vixen in the US. And that EQ head... what *is* that? I need one of those! I pulled out my 9VR for a quick look around Orion tonight - first clear night in a while. I could only see three of the Trap stars, but I did snag Rigel's companion using a 4mm Tasco ortho. The collimation was off a little, but the companion appeared to be between the first and second diffraction ring. I tried using some Unitron and Zeiss microscope eyepieces, but they aren't all that great at f/5. But for a short focus scope, it's quite good and it's a great grab-n-go. I'm a little surprise that the Vixen Halley (also known in Japan as "Tachyon Multi-70S") appeared on the US market. Tasco 9Vr and Tascos 10VR were sold in France in the 80's. The "Halley 70" is, before the New Planet 80S appeared, the last evolution of that series which included the X-Y fine adjustment on it. Well thought! Now, as for the EQ mount, it is a mini Super Polaris motorized in RA. If one for sale would show up, I'd let you know. I don't recall *ever* seeing any 70mm rich-field Vixen-made scope available in the US. 60mm and 80mm, yes, but not 70mm. I've had both (and the 60mm that this thread is about used to be mine). Anyone else stateside recall a 70mm rich-field like this? Nor do I recall seeing that mini-SP mount. I would *love* to have one of those. Yes, if you do ever seen one show up for sale, I would be most interested. Wish I'd had one for the last 10 years working with Scouts. I always had to use an alt-az mount because packing in an EQ mount on camping trips, etc. was just too much. You can buy 70/400 today but will be labeled Barska or something ,likewise many 80/400 scopes.Not so many shorty 90 or 100 mm.Quality varies,today's models have rather pitiful mounts/stands. Wouldn't buy one of the Chinese made scopes like this under any circumstances anyway. My point was that I never saw a Vixen-made (Japanese-made) 70/400 or the mini-SP before. I've still got one 80/400 Vixen-made which I'll hang on to. I've sold all the 60s I had. The 70 would be interesting just to see what it was like. Once in a while, I see one showing up. I'll watch over. 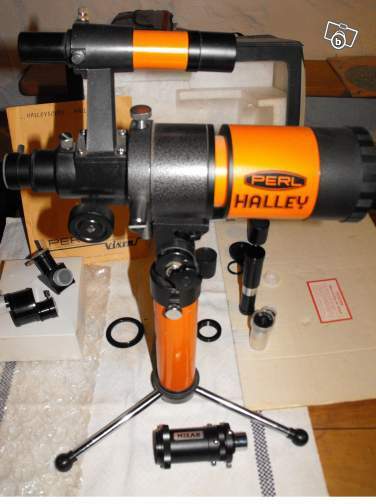 As for portability, I remember when I took part to some stargazing parties with other amateur astronomers in Corpus Christi, my "Halley" in its case in a hand, field tripod in the other and my mount in a backpack! 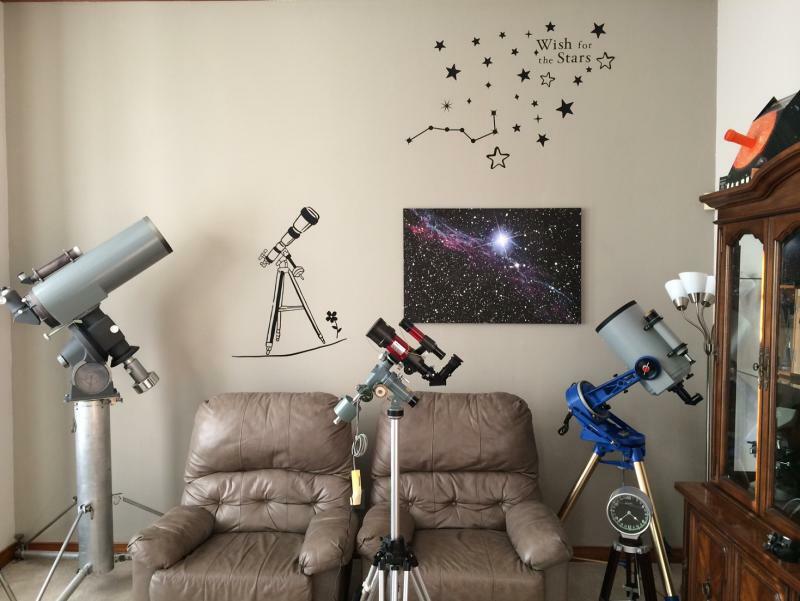 For a portable mini mount, another solution would be the Sky-Watcher Star Adventurer. Anyone reviewed it yet? Edited by Tourneciel, 27 December 2014 - 02:10 AM. Not a bargain, but perhaps appealing to someone looking for one of these 62mm f/5 refractors, or to a collector. Edited by SpaceNetworks, 27 December 2014 - 12:35 PM. The 70mm looks like the same scope Vixen sold as a guidescope back in the 1990s. I tried one and optics were not real good and I returned it and went with a longer 910mm guidescope. I also had a Cometron CO62 which was full aperture Vixen made like the 9VR that could only be used up to around 40x due to significant wedge or decentering of the cemented achromat. I even tried re cementing it but the crown and flint element diameters were different and I was not able to improve it much, since putting the elements in a V block did not center them. I kept the mount though, I use a TV60 on it now. Well that is disturbing.My CO-62 does quite well with a 4mmTMB,for example(75X) .Actually I have TWO.Bought the second to pass on to a friend after using the first one and being impressed. But friend thought the CO-62 too expensive at $75(my cost). Edited by terraclarke, 29 December 2014 - 12:30 PM. I was out last night with the 80mm Celestron/Vixen version and got a great look at Comet Lovejoy at about 10pm. It was almost on top of M79. Man, talk about easy to set up. Truly a one-hand proposition with the little table top tripod and slow motion control. Very nice but my mind got side tracked, I could get lost for a few days in your Library of books Terra! Let's try my original pics again. Thanks Du. That is just a tiny part of the library. I'm afraid that I am a bit of a book collector. You all inspired me to take my 9VR out tonight to check out the moon. It rides on a Takahashi Sky patrol Mount. I agree with everyone else, that the views through this little 60mm scope are spectacular for an f5 refractor. The 1.25" ocular adapter is the Vixen camera adapter 36.4mm DX which provides a nice rotating diagonal. The end covers are held on with chains that are attached to the tube screws. Edited by Steve_M_M, 31 December 2014 - 09:46 AM.